So the other night I had a weird dream. 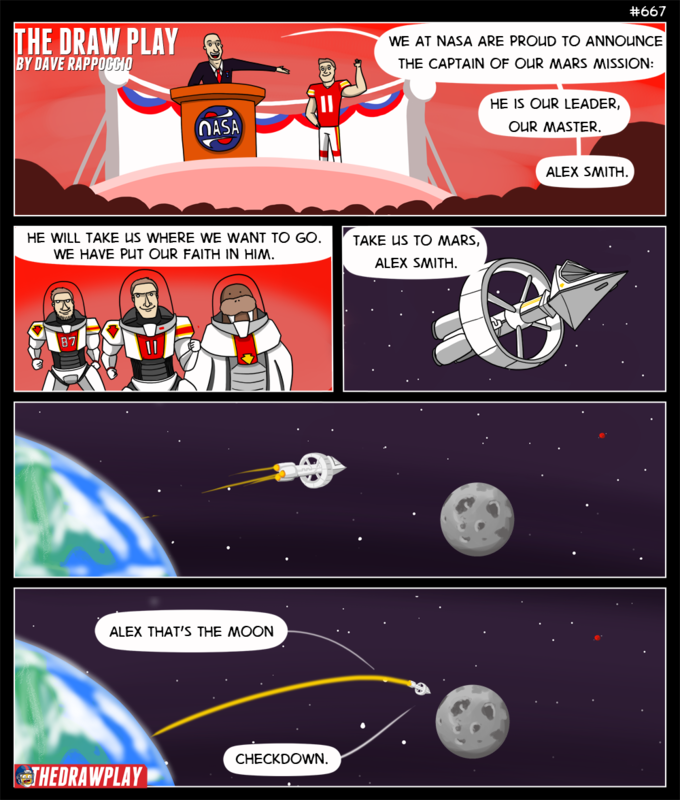 It involved a comic about Alex Smith. I thought it was kinda funny and decided I was going to make it. It’s rare enough that I remember a dream, let alone actually make a comic in one. I dreamed I came to this idea while walking through my elementary school parking lot. Dreams are weird. I’m probably still going to make it, but after a ton of failed drafts and struggles, I realized it was too much setup for an okay payoff. It would involve far too many panels to draw if I wanted to keep the dialogue down, or far too much expository dialogue, which always kind of ruins things. The problem with dreams is they make perfect sense when you’re in them, and the real world starts picking it apart. But, I still want to do the joke, so consider this the first of a series. That mediocre punchline will get a build up, but it will happen. It’s the offseason what the hell else is there to do? I like how the Chiefs drafted Pat Mahomes this past draft. When I saw that I laughed really hard, because he’s going to get Kaepernick’d again. Alex Smith is a flawed QB, and we’ve seen his peak. At this point we aren’t going to get a better Alex Smith, we’d have found it by now. He simply is Alex Smith. Pat Mahomes is just like Kaep: a QB with the opposite talents. Instead of an overly cautious dink n dunker, Mahomes is a fairly reckless instinctual kinda guy who loves chucking it. So soon we will see Mahomes in trick plays. A few random playbook guest appearances. He likely won’t even throw the ball the first few times, but function as a decoy for a run play. Then Smith will get his bell run. Or twist an ankle. Maybe catch a cold. Then it’ll happen. Mahomes will light it up, and in 6 years Pat will be a disappointment who half the country hates and the other thinks is a bad QB but likes as a person. I guess that means Andy Reid is the Michigan coach in 6 years too then, sorry Harbaugh. Actually, Reid would go back to either BYU, UTEP, or Missouri. Oh goody, hopefully this means a week(or more!) of Walrus. Always love seeing Andy the Walrus in your comics. But then his crew gets abducted by an alien spaceship and returned to the Sun for a galactic pick six. I don’t care if this punchline is supposed to be mediocre. I love it! Also, are alt text mouse over jokes a thing of the past or do you just not do them with some comics? That’s why there are typos on every third comic, I just want to bed. Digging this mouse over. Good jorb! So you’re telling me… You had an idea, and then you checked down? Also, Andy the Walrus would be the worst arena coach ever because the most important skill for an arena coach to have is good time (and timeout) management in last minute of each half, with the goal being ending the 1st half with the ball and scoring last in the 2nd half of the game, without giving the other team enough time to score. I do love a good series. I laughed at that last panel. Because, seriously, it’s so true. That being said. I like Alex Smith. I didn’t think he was the right pick when he was drafted. But I quickly began to feel bad for him because the 49ers had no clue what they were doing. I was happy to see him turn it around and experience some success. I was happy he went to KC. I’m happy he’s doing well (enough) there now. I would like to see him receive the appreciation I feel he is due. No, he doesn’t light the world on fire when he’s out there. But I can think of a dozen teams in this league that would be light years better with him under center. I think he’s good enough to be a Super Bowl winning QB with the right team. And with a few of the teams he’s had, he’s been close. In the end though, I guess his nature won out. Why go for the glory and the big win when you can checkdown. That’s probably the reason why gunslingers are popular. I’ve always liked Alex Smith. Found him to be a solid QB. Not great or elite. Just solid. Loved when he broke out of the bust label when Harbaugh came in. I was bummed when he got replaced by Kaepernick, but it made sense, so I wasn’t mad. Just felt for Alex a little. Was glad to see him go to KC and continue where he left off. It was enough for playoff material, but not enough for the SB. Which is far better than what was assumed of him 7 years ago. When Mahomes take over (and at some point, it’ll happen), I’ll still feel bummed and feel for Alex, but not as much as the first time. The first time, Alex only had about a season and a half under Harbaugh to showcase himself. This time, he’s entering his 5th stable season with KC. He’s 33. He’s proven himself all he can… at least enough to gain interest in having him join an NFL broadcast team when he retires. if Alex Smith was a Houston Texan, they’d win the superbowl. He’s fine as a QB and could be a superbowl winner if the rest of the team were as solidly competent as he is. Also he’d have a lot more wins – a loooot more wins – if Andy Reid cared to glance at the goddamn clock occasionally. Literally anyone not named Brock Osweiler could lead that team to a Super Bowl. I’ve said it since the draft, Deshaun Watson is going to win ROTY because he’s in the best situation possible. All he has to do is play mediocre and the Texans will go 13-3. Alex smith would thrive as a home ec. teacher. He would get teach so well, that those kids would have balancing a check DOWN. 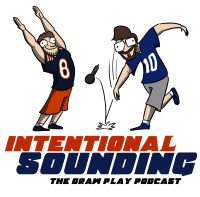 I feel like Alex Smith is checkdown incarnate. Safe, not as good as you want, and not going to win the game alone, but it won’t hurt you, and if you have enough talent around it, it can work. He is the ultimate human embodiment of his signature move, which isn’t the worst thing, he could be the human embodiment of a throw into triple coverage like Mark Sanchez, or the human embodiment of the overthrown bootleg pass like Tim Tebow.